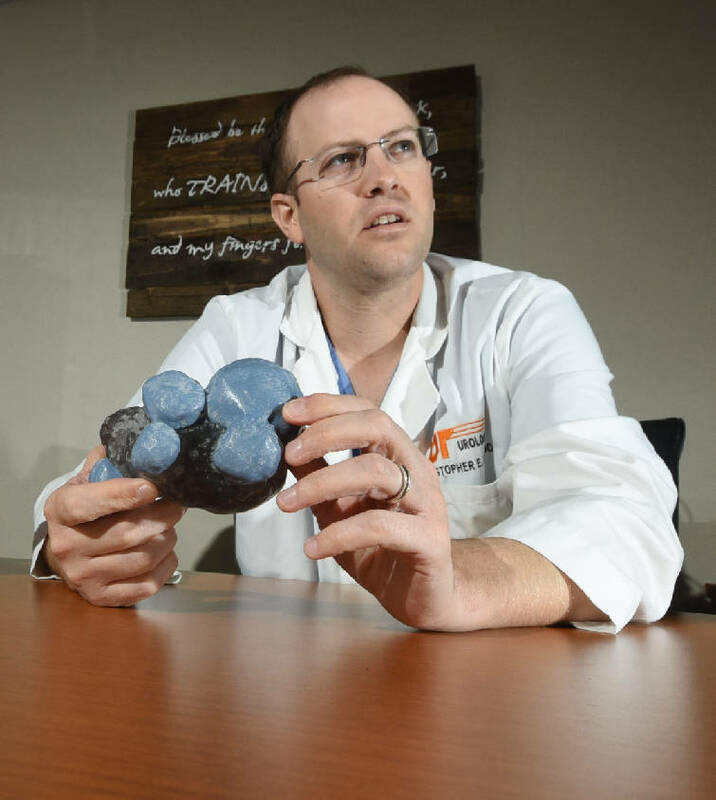 Erlanger urologist Dr. Chris Keel holds a 3-D model of a patient's kidney that he used to prepare for surgery. The blue color represents tumor on the kidney. Ricky Crowe didn't realize how big the tumor on his kidney was until he was in the recovery room. "I'd seen the pictures, but I just didn't understand it until he showed me that," Crowe said. "It helped a lot." More patients at Erlanger hospital will have Crowe's experience as a result of a contract the hospital signed Wednesday with 3D Ops, a local tech startup that hopes to launch a nationwide network of 3-D printing centers to give surgeons and patients a real-life look at damaged organs before starting surgery. What's key is that the model Keel used was not a normal kidney, but rather, a model of his patient's actual kidney — with all of its abnormalities. "It is Ricky's kidney," said Keith Campbell, president of 3D Ops. "You see the real thing." "There are some benefits in being able to see it in three dimensions and having a game plan when you get in there," he said. While he said he could have performed Crowe's surgery without the aid of the model, it made it easier for him to remove the tumor without taking out the kidney as well. "We were looking at what you could do with 3-D printing and he said, 'You know, we have all sorts of models of what is right. But we don't have models of what is wrong,'" Campbell said. The Erlanger contract is a major step forward in building what Campbell hopes will be a network of several dozen 3-D printing centers, serving hundreds of hospitals. 3D Ops' goal is to turn around the models in 24 hours or less. The company has patents, Campbell said, on the software that converts images from CT scans or MRIs — the expensive machines hospitals use to capture an image of the insides of the body — into a format that can be used for 3-D printing. Keel believes the modeling would be particularly helpful for reconstructive surgery, where a doctor may need to bend pieces of metal around bones in order to reshape a face. If the metal could be shaped in advance using the physical model, he said, it could dramatically shorten the length of the operation. 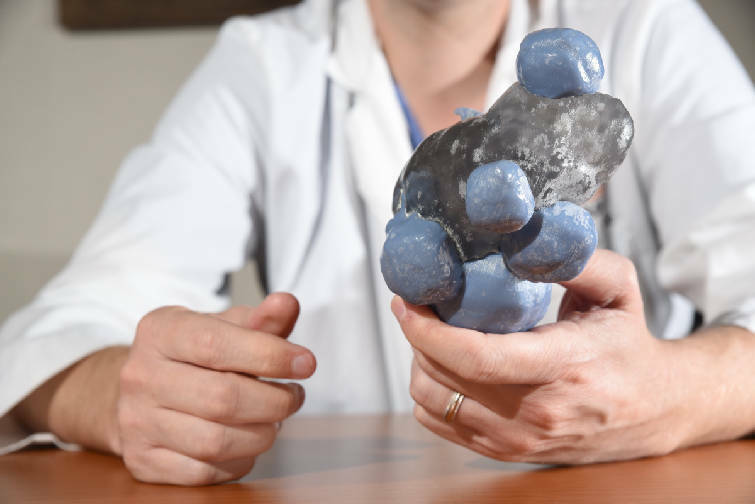 Erlanger Urologist Dr. Chris Keel holds a 3D model of a patient's kidney that he used to prepare for surgery. The blue color represents tumor on the kidney. Campbell is also optimistic about future improvements in 3-D printing. "By the fifth year, we're a $49 million company in revenue, $20 million in profit," Campbell said. Contact Steve Johnson at sjohnson@timesfreepress.com, or at 423-757-6673, or follow him on Twitter at stevejohnson TFP.